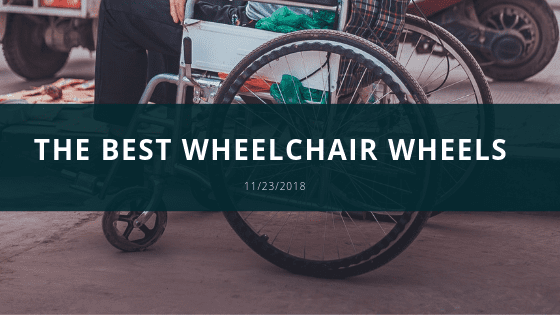 There are many types of wheels for wheelchairs that serve different purposes, so the best wheel is determined based on the purpose that the individual intends for. The different types of wheels can be categorized as pneumatic tires, solid tires, and flat free tires. Pneumatic tires are those that contain an inner tube that is inflated. Solid tires are attached to the rim and are made from materials like rubber or plastics which makes it durable and nearly maintenance free. Flat free tires are similar to both. They are like a pneumatic tire; however, the inner tube isn’t filled with air but is filled with semi-solid foam or rubber. Pneumatic tires are best for wheelchair users that want a smoother ride on various terrains. Due to the air filled inner tube, it helps absorb shocks from bumpy rides allowing the wheelchair user to have a more comfortable ride. However, there are downsides to this type of wheels. Since they are softer than the other wheels they are much harder to propel over different terrains. In the case of electric wheelchairs with pneumatic tires, the battery tends to last less due to the extra energy needed to propel the wheelchair. Solid tires are one of the most common tires used on manual wheelchairs and are used on flat surfaces. They are denser which causes less friction when rotating and makes it easier to propel on flat surfaces. They are the most durable tire available to wheelchair users and most common due to the fact that they don’t require much maintenance. The downside to these type of wheels is that they are strictly for solid surfaces thus limiting the mobility of the user. They are also not shock absorbent which causes the wheelchair user to feel a bit uncomfortable when riding on flat surfaces with bumps. The last type of wheel is the flat freewheel which is a mixture of the two previous wheels mentions above. It is great for bumpy terrains because it absorbs shocks and provides a comfortable ride without running the risk of getting a flat tire because it isn’t inflated with air. It can be used in various terrains because it contains texture on the outside that prevents it from getting stuck. Like the pneumatic tire, it is not completely solid which makes it harder to propel. The best wheel would be the one that helps the individual in the best way to gain the most mobility to complete their daily task and enjoy life.